One thing that can be said about Paul Pasqualoni's tenure as UConn's head coach is that he has been able to land the top in-state quarterbacks. Two years ago it was record-breaking Masuk High star Casey Cochran and Xavier's Tim Boyle is one of the headliners in the incoming freshman class. 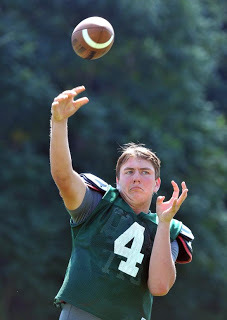 Now Hamden Hall's T.J. Linta is the prolific passer attracting attention from the Huskies. The 6-foot-4, 230-pound Linta passed for 3,110 yards with 28 touchdowns and eight interceptions in 11 games as a junior at Hamden Hall. He had three 400-yard passing games and was also the Hornets' leading rusher with 474 yards to go with eight rushing touchdowns. A couple of UConn coaches including quarterbacks coach Shane Day are expected to do a home visit with Linta in the coming days. Linta is a good enough student to draw serious interest from Ivy League schools and a few months ago perhaps the Ivy League would have been the likely landing spot for him. However, he is starting to get noticed by BCS programs including Pittsburgh and UConn. Linta and his father, Hamden Hall football coach and NFL agent Joe Linta, took in one of the spring practices at UConn.